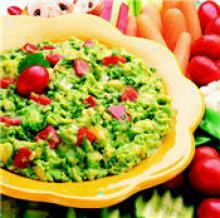 California Style Guacamole is yet another terrific guacamole recipe! This one was provided by our friends at the Haas Avocado Advisory Board. I didn't know there was such a board but based on the excellent avocados we get from Haas (they're my favorite) I'm glad there is! So what makes this style of guacamole any different from any other? Still got the requisite avocados, cilantro, onions, tomatoes and so on. Well this one also includes using Anaheim peppers. And not just chopping them into the guac but first, charring them! Ummm...does that sound great or what? So if you like a great guacamole you will love this California Style Guac! Give it a try soon! directly on the stove burner. 5. Place the avocados in a large bowl and mash. 6. Stir in lime juice. 7. Add remaining ingredients and mix well. 8. Refrigerate for 30 minutes and serve with chips.